Chabad of North Phoenix is a non-profit organization entirely locally supported. 100% of the funds donated go directly to support the vital good work we do for the local community . Chabad's goal is to serve the community with unconditional love for every Jew and to ensure Jewish continuity through increasing pride, knowledge, and commitment. Chabad offers a place of warmth and a welcoming hub for Jewish life - for every single Jew, regardless of affiliation, religiosity, status or orientation. Help us with continued financial stability. monthly. Your monthly support will make you a partner in the myriads of programing and support we offer to the entire community. As a bonus we will credit your next 3 month of monthly donations in equivalent raffle tickets. 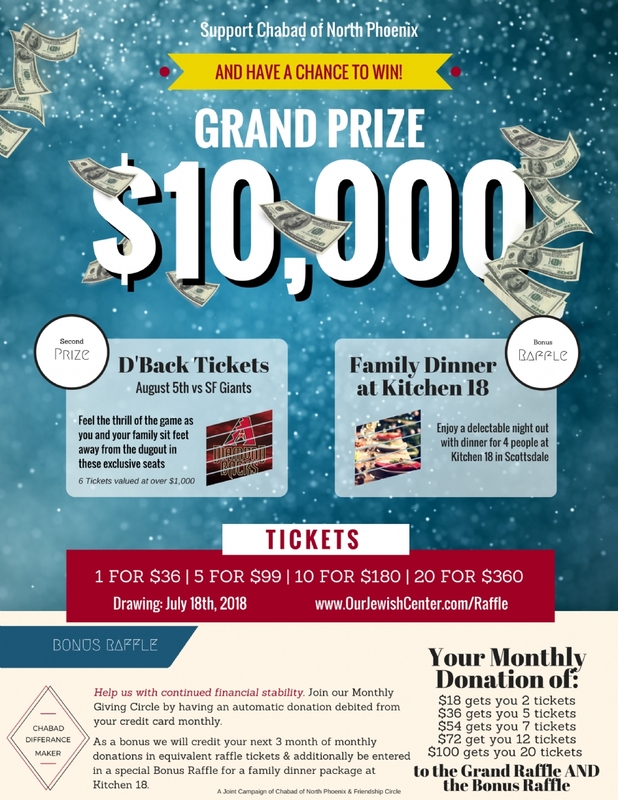 & additionally be entered in a special Bonus Raffle just for new monthly donors for a family dinner at Kitchen 18.
will be considered a donation.